Is there any better flower for a hot summer day? And by hot, we mean temperatures over 100 degrees Fahrenheit day after day with nary a drop of rain. The weather forecasters call it "extreme heat". It's miserable for everyone and I refuse to give in to it, though I have renamed summer "simmer" because you can almost keep a pot of boiling water simmering if you take it outside. Plus when I say "how's your simmer going" people will think either I don't know how to pronounce summer or I have some odd accent. If they think I have some odd accent then they will listen to me talk and wonder where I am from. If they think I mispronounced summer, they'll be listening only to figure out when they can interrupt me to correct me. In both situations, they won't remember a thing I say, so I can say pretty much say anything. Goodness. I think the heat is getting to me. I'm starting to sound like I have the logic of a garden fairy and I've gone completely off track. Where were we? Oh, yes, behold the coneflower, Echinacea purpurea. In its native form, the coneflower does quite well in the simmer-time. I can't say the same about the fancy varieties that have been flooding the garden centers in recent years. I don't grow many of them, though I do hear some good things about the variety 'Hot Papaya'. I have also heard if you don't let them flower the first year you plant them, the fancy variety coneflowers will do better in later years, as in actually survive and return after the winter. Winter? Did I just write winter? I'm not exactly looking forward to winter but I do hope for a slow, wet, cool, rainy fall. Something English like would be nice. Hey, a gardener can dream, can't she? Everyone in this area is having the same dream. Oh, yes, that heat does tend to cook the little grey cells. I swear I'd rather be in January with 2 feet of snow and -5F. I'd probably be spending more time outside. Thank goodness for coneflowers. Love those coneflowers. I'm dreaming of a nice English fall, too. Or summer, aplenty they are in for a long wet spell now -- maybe into the Olympics. But they'll have happy gardens! The cone flowers are the most hearty and reliable flowers in my garden. The seem to thrive in the heat. Love them. It's useful to know about not allowing those new echinacea varieties to bloom the first year. I always drool over them when I see them in the catalogs or nursery but end up passing them by since as hybrids I assume that they don't come back true from reseeding. I like big drifts of things like that and can't afford the numbers needed to produce a drift. Some really nice colors there though. I keep hearing about a cool down coming but it always seems that just as it's supposed to arrive it get pushed down the road another few days. Too long without rain and the heat is just about unbearable. How did people survive without air condiitioning? I like the old-fashioned coneflower as you depicted it. The new ones are tempting, but I heard they are not as beneficial to wildlife as the original, true natives are. Can't remember where I heard that, but it was something I had been wondering about. On the good news side, my veggie garden has been remarkably free of insect pests this year (so far). I had thought that the mild winter would have permitted more survival of the pests, so I'm feeling lucky. Nothing better for summer color, drought and heat tolerant and pollinator loving than the Echinaceas, old school. If you can't find them, buy a pack of seeds, they are easy to germinate outside. Happy simmer! I think we agree here, the best coneflowers are the originals. I've tried many varieties, but mostly, I count on the basic purple coneflower. Although I have to admit that the coconut lime variety has returned for me for three or four years running, so don't be afraid to try that one. I tried a new Pow wow white variety recently and wasn't impressed - maybe not letting it flower would have helped. Nothing like tough original natives! I grow the white swan variety, but they seem to like dappled light here in Santa Fe and are not as drought tolerant as in other places. 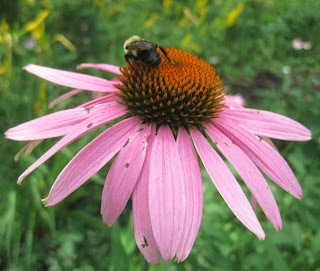 I have a new favorite flower---the purple coneflower!! Not only are they surviving this IN heat and drought, but they are thriving in my garden bed! Thanks for the heads-up on the cultivars. I think I'll stick to the species while we are in this weather cycle. I'm not dreaming about anything but more rain, preferably at night, preferably gentle. And no rabbits. My coneflowers will bloom soon. They don't seem to mind this dry period. You might as well live in Texas with weather like that! I hope the heat breaks soon. Good to know there's some additional risk in the new varieties. In general, I go for the tried and true and have not yet attempted the new ones, but the idea of a rose-scented purple coneflower is probably just too alluring not to draw me in eventually. Hope the weather turned cooler for you yesterday as it did for us, and that you also got a nice rainshower as we did. First time viewer here. I came for gardening tips and got the bonus of a new word. It's simmer time from now on! This plant is on my garden wish list for next year. Can't wait to try it out. Thanks for your insight on the new vs. older variety.